Twenty eleven hasn’t been a great year for us personally. 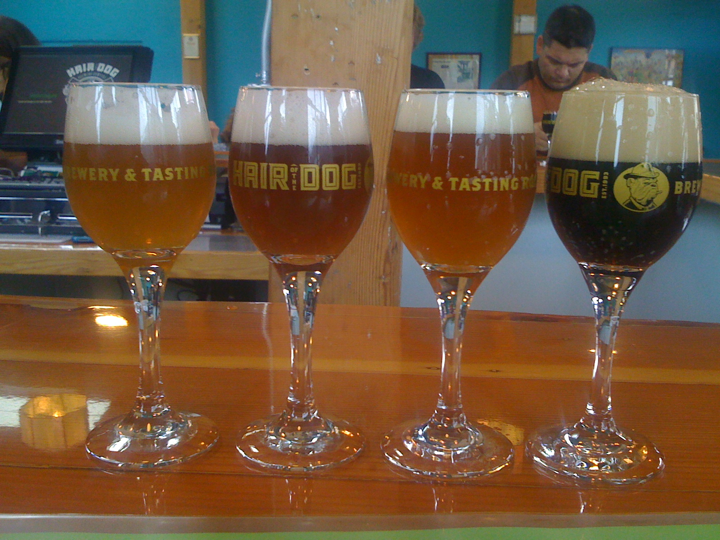 Writing about beer doesn’t seem to be as important, and Good Beer Trips has suffered. That said,two weekends ago we took a bit of a trip, not a Good Beer Trip, but we still managed to find good beer. Family events took us to Stevenson and Portland; we tagged on an additional day for ourselves and made it to Hood River and White Salmon. In Hood River our first stop was Full Sail Brewing, one of our favorite spots to eat, drink beer, and watch the Columbia River action below. After an afternoon of driving, the burger and salad we split sure hit the spot. Likewise, the beer was just what we needed. 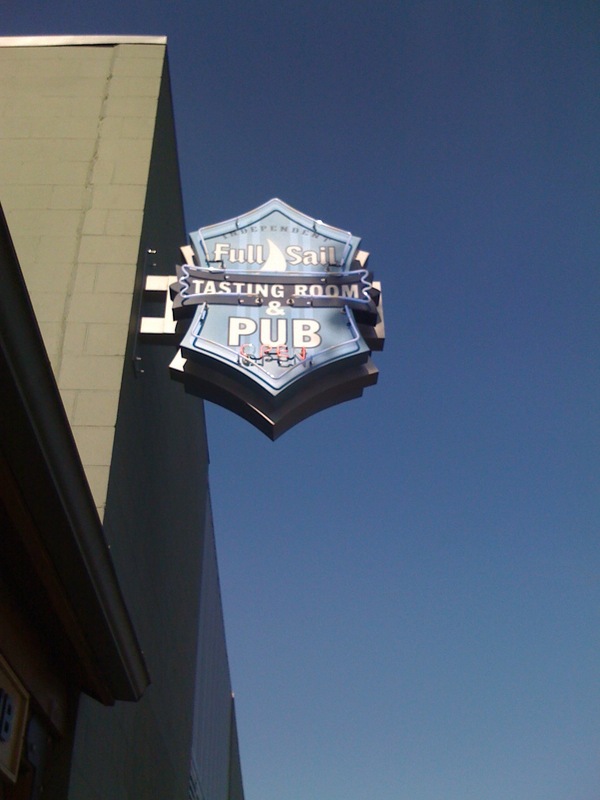 The thing I like about Full Sail (other than the amazing view) is that they always have something on tap in the pub that they don’t have in bottles. On this occasion LushC (aka @torkwench) went with the LawnBrau red lager. It was smooth, and mildly bitter. At 6.4% ABV it was a very potent lawn beer. She mentioned that it really made her want to watch Lawn Dogs. I went with the Hop Pursuit Extra Pale which started as an unambiguous malty pale but had a snappy bitter hop finish. After leaving Full Sail, we crossed the street and went to Double Mountain Brewery. How many towns can claim to have two great breweries so close to each other, yet alone a third (Big Horse) only blocks away? This was our third trip here and was much better than our experience last year. For one, it was a Thursday night, and not super crowded, and secondly I wasn’t starting to get sick. We were a bit bummed we had just eaten, because we had forgotten how good their menu was. Oh well, their beer menu was just as enticing. The saucy LuschC ordered a Red Light District. It was a much bigger beer than she was expecting; very complex with flavors of caramel and honey with a twinge of sour. At 9.4% ABV it really socked it to her. In contrast, Dapper Dan was a British session style Brown Ale served on nitro. It was robust in flavor, smooth, very drinkable, and only 3.5% ABV. A good first choice if I do say so myself. I needed a little bit more to complete my night, and the Clusterf#ck Single Hop IPA sounded like it would do the trick. It lived up to its hop forward IPA billing, and to my expectations. The next day we crossed the river to White Salmon, for lunch at Everybody’s Brewing. It was another beautiful sunny day, and these sun deprived folks were stoked to sit outside on the back deck. Everybody’s has quickly become one of our favorites. The menu and the beer are both great, and the people and service push it over the edge. We ordered wings and a salad, and we were not disappointed. Urbanbeerhiker might think the wings were a bit scrawny, but they were free range, the meat was grilled to perfection, the sauce was were spicy, and they were good. To wash them down, LushC had a Daily Bread Common Ale, and I had a Law of Nature Pale Ale. For dessert I had a Bro Brah Bitter ESB. (I got some chocolate for LushC). We continued onto Stevenson. We had some time to burn before the family fun began so we ventured to Walking Man Brewing. Last time were here the weather was crappy so we sat inside, this time, with the sun shining we took advantage of their outdoor patio seating. We enjoyed the sun so much; I failed to take note of our beers and food. I do remember we ordered a hummus plate, I had a Knuckle Dragger, and being happy, but that is it. On Saturday we had about four hours to ourselves in Portland in between family events. I was feeling a bit hung-over from the day before, and really didn’t feel too much like drinking beer, yet. (I know, kind of sacrilegious in Portland.) While waiting for LushC to check out at The Nordstrom Rack I decided to Google map breweries near us, and my feelings began change. Low and behold, Hair of the Dog Brewery was only .9 miles away and I suddenly needed a cure for my hangover. We crossed the river and quickly found the new location for this Portland institution. We walked right in, and immediately dug it. I don’t know why, but I love bars in old industrial buildings. I guess I just like that urban chic feel with large doors, lots of light, concrete and exposed wood beams. LushC enjoyed the Bollywood style bright turquoise and Kelly green walls as well as the ornate vintage pendant lights. We found a seat at the bar, and perused the menu for beer and food. The menu was pretty gourmet for a brewpub with choices like Pork Toast, Duck Confit, and Chuck Norris Duck Wings. We ordered the Pan Roasted Brussels Sprouts, a Brewhouse Salad, the local pickled veggie plate, and a side of fresh bread. All were very fresh and very tasty. Missing our pooches back home we both decided to Walk the Dog. (aka Sampler Tray). It included a sherry glass of Ruth, Blue Dot, Fred and Adam. To complete the experience we shared a sample of Cherry Adam from the Wood. 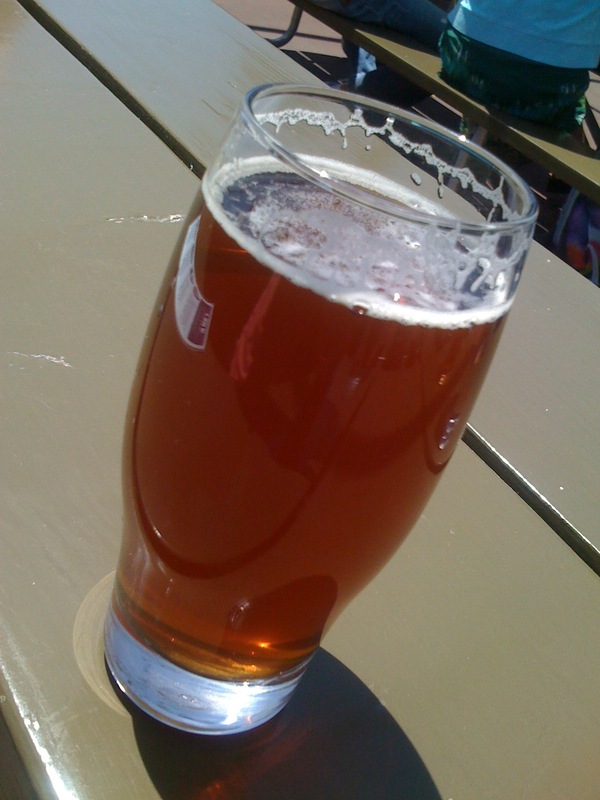 Ruth American Pale Ale – cloudy pale, well carbonated, and thin white head. Pilsner malt backbone and crisp bitter hop finish. Nice good session beer with flavor. Blue Dot Double IPA – amber in hue with a sweet citrus aroma. Taste is sweet and hoppy but not too hoppy. Fred Golden Strong Ale – dark golden in color with aromas of candy sugar. Starts off light but finishes with a lot of flavor. It’s like a good one night stand that knows when to leave. Adam – chestnut color with flavors of roasted malt, chocolate and a bit if smoke; a good beer to go fishing with. Unfortunately, our time at Hair of the Dog was short. The good news is we’ll be back to Portland in August and we will return. P.S. If you missed last year’s two part piece on our trip to the Columbia River Gorge, here they are: Part 1, Part 2. FTC Info: Nothing was received for the writhing of this post. ← Bob’s Brown Day is Here!